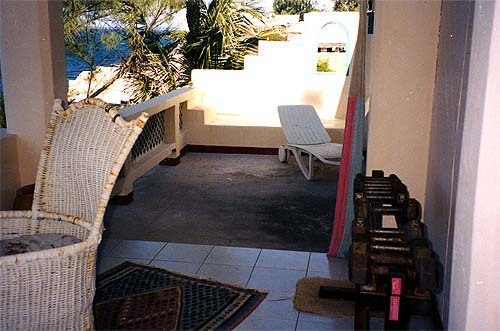 Negril - House rental in negril jamaica - Spring Break 2008. Click Here for Larger Photo. Photo is 176K, please wait while it loads. Located in Negril Jamaica this oceanfront house provides a private vacation in paradise with all of the comforts of home. 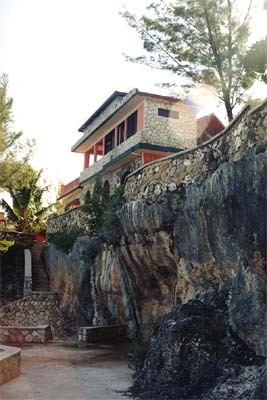 The house sits on the famous cliffs of Negril Jamaica where some of the most beautiful sunsets are right in your own backyard along with a private cove for some of the best snorkeling in Negril. And not to mention, your own private sunbathing landings for that perfect tan. PRIVATE COOK / FOOD PREPARATION - For the guest that do not want the worrying of cooking and food preparation, let our staff do it all for you. DAILY MAID SERVICE - The rooms are serviced on a regular basis and there is never any shortage of soap or towels. Your house keeper will also do your laundry if you would like on a daily basis. 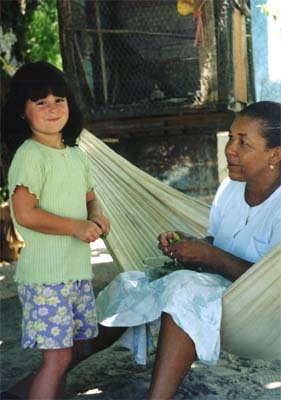 The People - You will experience warm and wonderful vibes when in the company of the Jamaicans locals here in Negril. This might happen as you enjoying a slice of coco bread and a cup of blue mountain coffee. Remember, come to Jamaica for the atmosphere, people, and beautiful scenery. These things are what makes Jamaica unique and such a special experience. Verandah - Your private verandah affords you a romantic dinner with a view that is the vanishing point on the horizon. The feeling is romantic, spacious and breezy. After the sun sets... Then stars stretch forever...At this point nothing will wake you until you're ready. Villas Backyard with ocean view - . 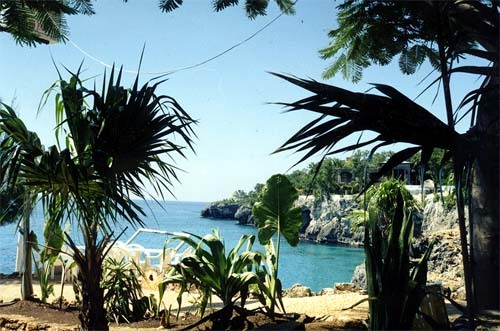 Located right in the heart of Negril, the view is incredible with lush backyard and gorgeous views from the grounds providing authentic Jamaican flavor away from the crowds of more populated areas. Backyard - Lush backyard with all the amenities of home. 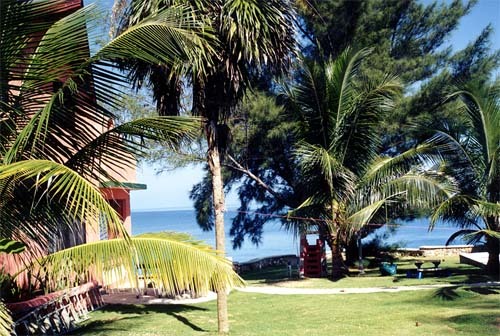 If you are looking to rid your life of "STRESS",then Negril Jamaica should be your choice for huge amounts of privacy, while the ability to range the Jamaican countryside on your own along with the option of a guided tour if you choose. 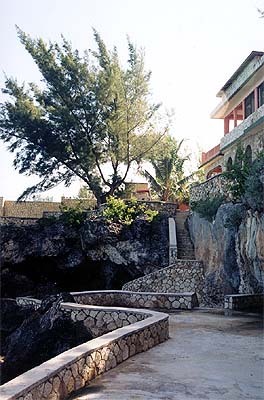 Villa Sea Access - The Stone Stairway leads down to the clear Caribbean waters just steps from your room. If you want to sun and swim in the beautiful cove with lovely diving opportunities, and snorkeling this is the place! Negril Garden View - The garden view overlooking the ocean has a wonderful variety of different plants and trees to look at. The property is very, very lush, a true garden of Eden. You can see the ocean between coconut trees without getting out of bed. 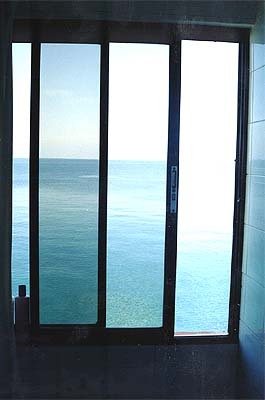 Master Bath - There were a couple of different views that can be seen from each room as seen in this double shower and Jacuzzi bath with 3 large windows overlooking the sea. 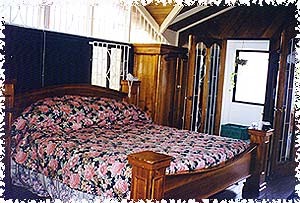 The rooms are serviced on a regular basis and there is never any shortage of soap or towels. 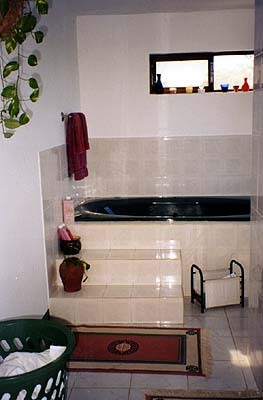 4 additional baths - All full baths with bathtub and shower. Master Bedroom - With its view out to the sea and the entrance to your private verandah on the right and the master bath on the left, need I say more! 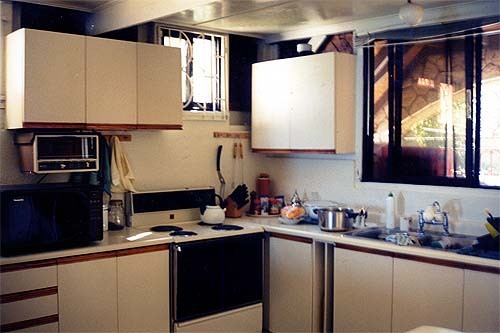 Kitchen - 16 x 16 full size refrigerator,electric stove, microwave. The food here is quite delightful with fresh seafood and fruits and vegetables served up in Jamaican style. Sometimes one might choose to buy fish from the fisherman on the beach and cook it yourself. 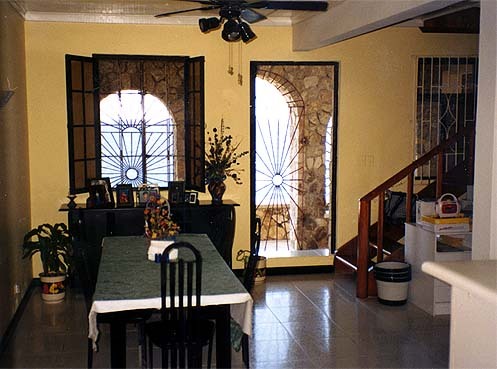 All Paradise Cove Negril Villa rentals will accommodate up to 12 persons.